If you drive a sports sedan or coupe with a focus on performance throughout the year, then you should take a look at the Continental ContiTouringContact CH95. Continental has used their advanced manufacturing techniques to come out with a high performance touring tire to suit your needs. The Continental CH95 has a lower rolling resistance due to the latest compound used in the tread. The result is better overall fuel mileage. The low rolling resistance is also helped due to a weight optimized construction of the tire. The symmetrical tread design holds the compound that makes it easy to rotate tires and enhance tread life. The compound is an integral part of the tire’s wet and snow traction abilities as well. On a closer look at the tire you will see dense sipes which makes the tire good for light snow and provides biting edges which is the main reason for improved traction in such conditions. It also provides for a much lower risk of hydroplaning on wet roads. A unique aspect with the ContiTouringContact CH95 is the tri-radial contour on its tread. This kind of tread is proven to ensure even wear on the tire and give you a much quieter ride. If you are speaking to passengers in your vehicle you will be able to easily make yourself heard even at high speeds. Inside the tread, the ContiTouringContact CH95 provides excellent handling ability due to a Jointless Spiral Cap on the tire. Drivers have reported excellent control over their vehicle even at much high speeds. The tire is very comfortable compared with other tires in the same category. 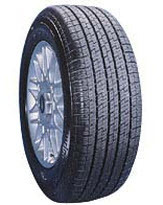 Overall the Continental ContiTouringContact CH95 is truly an enthusiasts tire with good handling abilities and an exceptionally comfortable ride. Prices for the Continental ContiTouringContact CH95 range from around $148 for the 16 inch tires to approximately $160 for the 17 inch tire. Who Are Continental ContiTouringContact CH95 Tire Designed For? The Continental ContiTouringContact CH95 tires are for drivers who are seeking a touring all season tire that offers excellent grip and handling in all types of weather and road conditions, as well as a very comfortable and quiet ride. Continental backs up the ContiTouringContact with a uniformity guarantee of one-year or the first 2/32 inches of wear. Materials and workmanship are guaranteed for six-years and include a free replacement tire in first year or first 2/32 inches of wear. Continental then prorates the remaining time period until there is less than 2/32 inches of remaining useable tread depth. A manufacturer’s road hazard warranty is also included for the first year or first 2/32 inch of wear. You will also receive a 30-day satisfaction guarantee whereby you can exchange the tires for another Continental model if you are not completely satisfied.